You can climb the rocks that form the eastern wall of Jobson's Cove and get a view not only of Jobson's but of Warwick Long Bay to the east. Warwick stretches out about a half mile in a straight line. 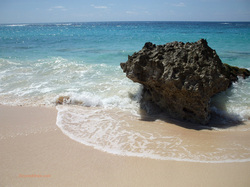 It is pink sand bordered by turquoise water. A couple of carved rock formations stand in isolation off shore giving the beach a distinctive trademark. Despite its size, Warwick is not usually crowded. Most people tend to stay near the western end of the beach where there is a road leading up the hill to South Road and a concession stand. Also, the water seems calmer here, particularly near the rock formations that divide Warwick from Jobson's Cove. Although there is a reef lying offshore that does mitigate the size of the waves, it has always appeared to me to be more wave action here than at the other beaches. Walking along Warwick towards its eastern end, you get glimpses of mansions and homes perched on the crest of the hill. Looking out to sea, the turquoise water turns into the Prussian blue of the Atlantic, which stretches out to the horizon. Above: Warwick Long Bay Beach looking east. 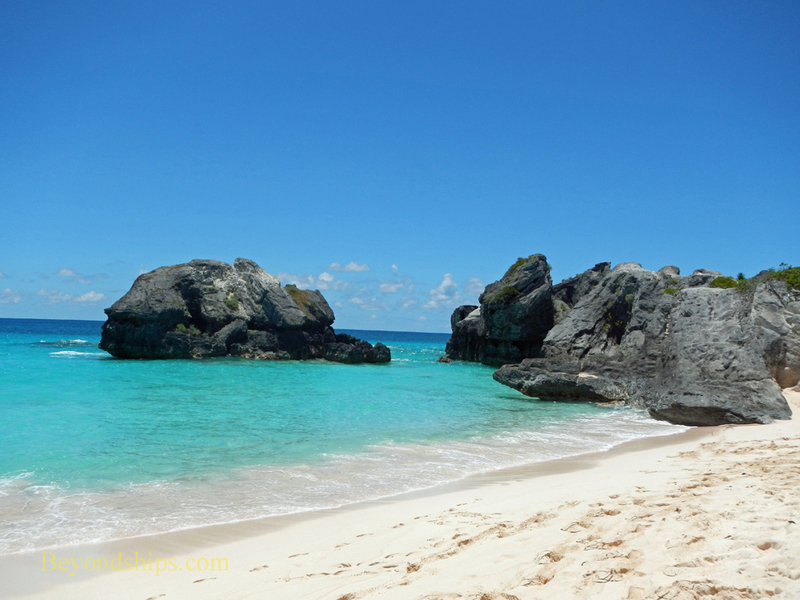 Below: The tall rocks at the western end of the beach that separate Warwick from Jobson's Cove. Above: The bus shelter is situated along a scenic stretch of South Road. Above: Scenes along Front Street. Below: The fast ferry terminal in Hamilton. Returning to the western end of the beach, I followed the roadway up to South Road. About 20 yards west from the intersection, there are two bus shelters. If you stay on the same side as the beach, you can catch a bus heading back to the Dockyards. If you cross the road (be careful to look both ways), you can catch a bus into Hamilton. There are two reasons to go to Hamilton. First, you are not retracing your steps and so you get to see something different. Second, the buses are used not just by the tourists but also by the locals. 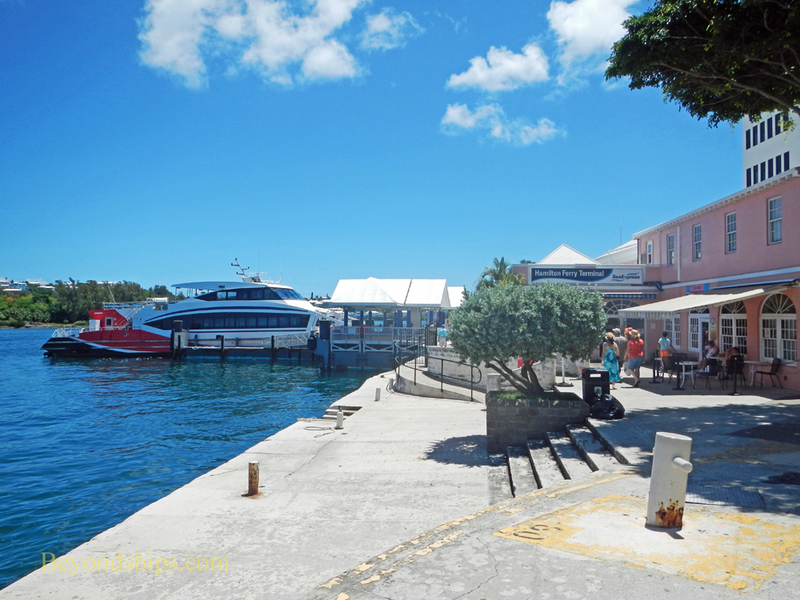 Bermudians tend to be polite and friendly so you may get to talk to some as well as get a glimpse of everyday life in Bermuda. It is only about three miles to Hamilton so the ride does not take very long. 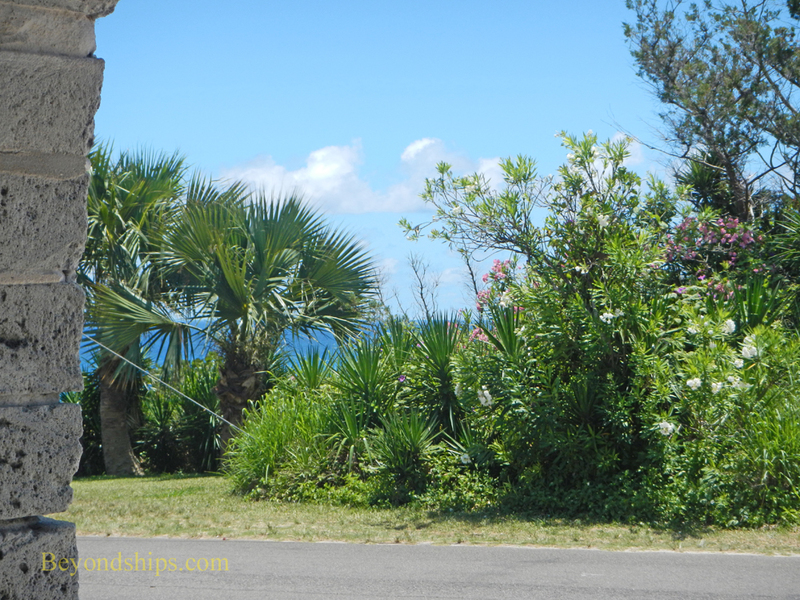 The bus goes by the Bermuda Underwater Institute at the edge of town and you can alight to see its exhibits. Or you can carry on further into town. I like to get off the bus along Front Street, Hamilton's traditional main street. Although most of the traditional British shops are now gone, much of the colonial architecture remains. Traveling along Front Street, whether by foot or by bus, you eventually come to the ferry terminal. From here, you can take the high speed ferry back to the Dockyards. The open upper deck offers a good view of the waterside mansions of the rich and famous. Furthermore, when the ferry turns to enter the dockyard you can see the cruise ships at King's Wharf and Heritage Wharf. The ferry docks in the middle of the Dockyard complex, not far from either of the cruise ship berths.